The Eagles lost to the 49ers on Sunday 26-21 in what essentially came down to two plays by the Eagles on 3rd and 4th-and-Goal from just outside the 1-yard line. There is no denying it was a close game - even though the Eagles offense was unable to move the ball all day. The Eagles made a few interesting decisions - or lack of decisions - in the second half including not challenging a 3rd-down conversion reception and accepting a penalty on 3rd-and-3 after an incompletion. Let's examine each and see how they could have affected the Eagles' win probability, keeping in mind that in close games, every percentage point counts. With 2:09 left in the 3rd quarter, winning 23-21, San Francisco faced a 3rd-and-9 from their own 27. Colin Kaepernick dropped back and hooked up with Anquan Boldin for a 12-yard completion. It appeared Boldin bobbled the ball and potentially trapped it on the completion. In today's game where most of the biggest plays are automatically reviewed (scoring plays and turnovers), a long 3rd-down conversion in a close game is one of the higher leverage challenge situations. After the conversion, the Eagles' win probability was just 29.7% (including team strength). Had the call been challenged and reversed, the Eagles win probability would have been 41.9%. That's a huge potential swing of 12.2%. So, what would the probability of the play being reversed need to be for the Eagles to challenge the play - keeping in mind that if the Eagles lost the challenge, they would lose a timeout in a game where they were trailing? Here, the only difference between WP No Challenge and WP Lose Challenge is the cost of the first timeout for the Eagles (and losing one of two available challenges), which is approximately 1.0%. So, as long as the Eagles thought there was at least a 7.6% chance that the call would be reversed, it was worth it to throw the challenge flag. Interestingly enough, the Eagles hired a former ACC senior replay official this season to help Chip Kelly decide when to challenge plays. That may mean he looked at the play and believed there was not substantial evidence to overturn the call. The second interesting decision came with 9:25 left in the 4th quarter on the Niners very next drive. Still up 23-21, Kaepernick targeted Michael Crabtree on 3rd-and-3 from the Philly 24-yard line, but came up incomplete. Derek Carrier was called for offensive pass interference on the play, so Chip Kelly had the choice of giving the 49ers a 4th-and-3 on the 24 or a 3rd-and-13 on the Eagles 34. Kelly took awhile to make the decision, but ultimately decided to back the 49ers up. Kaepernick ran for 16 yards, converting the long 3rd down and San Francisco would ultimately kick a field goal to go up 26-21. My initial reaction was that this was essentially a toss up, but let's see what the numbers say. Keep in mind, these are league-wide averages, so they are just baselines, but they are also the best starting point for this kind of analysis. Decline penalty: 4th-and-3 at the PHI 24 (WP = 22.6%). We cannot assume the 49ers would have kicked a field goal, but using our Markov model, we can look at how teams generally make decisions. 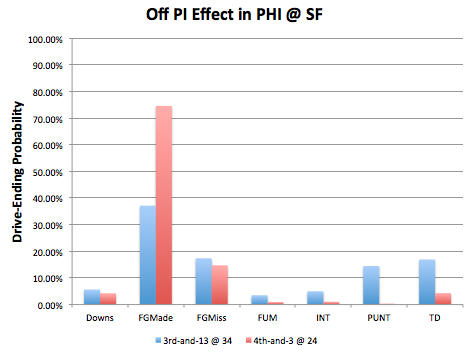 The Eagles win probability given that the 49ers attempted a field goal (83.5% conversion rate from that distance) would be 22.5% - it is lower because going for it is actually ever-so-slightly the percentage play for the 49ers. One more interesting thing to consider is the length of the drive in terms of time on the clock. As the trailing team, the Eagles want as much time left on the clock as possible. By accepting the penalty and giving the 49ers an extra down - and potentially several extra downs - the expected time at which the Eagles would get the ball back dropped from 8:58 left in the 4th to 8:20 left in the 4th. All this being said, it looks like Chip Kelly did make the correct decision from a numbers perspective. Accepting the penalty added about 1.7% to the Eagles win probability. Kelly was criticized by the announcers (and some of my closest friends) after Kaepernick converted the 3rd-and-long, but it is always important to judge a decision based on the process, not the outcome. The decision that jumped out at me during the game was when the 49ers decided to take 1 point instead of going for 2 when down 19 to 21. It seems like a classic example of a place to go for 2, but the WP calculator suggests taking the kick is (marginally) better. Shouldn't you calculate the 34yard line field goal conversion based on the kicker's percentage of 30-39? Phil Dawson has a 94.6% for 20-29 vs 85.7% for 30-39yards for a life long career made/attempt percentage. 90.2% vs 90.3% since 2010. I don't know if that is calculated in the WP calculator, but I don't see how the WP would be more in favor of the accept penalty if those percentages are used instead. 34-yard line would be a 51-52 yard field goal, not a 30-39 yard field goal. Likewise, 24-yard line would be a 41-42 yard field goal. Since 2010 is definitely too small a sample size (one missed kick can swing the percentage by almost 5%). That's why I use league averages adjusted for era.